Earliest Blackberry AND Needs no Trellis! Arapaho Thornless Blackberry (Rubus fruiticosus 'Arapaho') was designed with the home gardener in mind. Crossed and re-crossed with the best of the best, Arapaho is the first thornless Blackberry vine that doesn't need a trellis to support it AND produces Blackberries a full WEEK before any other thornless Blackberry. Imagine a beautiful row of these in your backyard, with their tall stems arching gracefully over into one another. They bust out in flowers in spring and by midsummer those flowers have been replaced with juicy gloss-black berries that are bursting with melt-in-your mouth summer flavor. These berries aren't wimps, either. 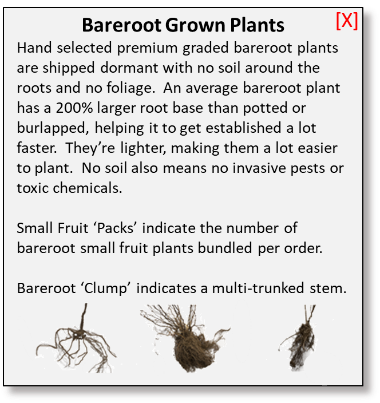 They are solid, medium-sized fruits that will last better in storage than any other Blackberry. Fresh-picked Arapaho berries can last a week in your fridge without going soft. As if that isn't enough to sell you on the benefits of Arapaho, remember that they don't need a pollinator, so a single vine will produce for you. But, honestly, once you start picking these delicious berries, you're going to just be wishing you'd have planted more vines! Add to that the fact that these guys sail through the hot summer with no need for spraying and how can you say no?  Nature Hills ships out strong, thick-stemmed Arapaho vines that will get you off to a great gardening start. Order yours today. We bet you can't stop at just one!